When a movie runs two and a half hours, yet the ending arrives as an unwelcome surprise, you know that film has done something right. The Hunger Games: Catching Fire is that film, one that manages to do just about everything right. From the start, it raises the stakes from last year’s franchise debut. While The Hunger Games was certainly a competent adventure, it was content (perhaps understandably) to work within the “young adult” parameters of Suzanne Collins’s source novel. Catching Fire deals in more mature themes and sophisticated ideas, weaving an intelligent script, impressive direction and superlative performances into a massively entertaining blockbuster that leaves you anxious for the next chapter. 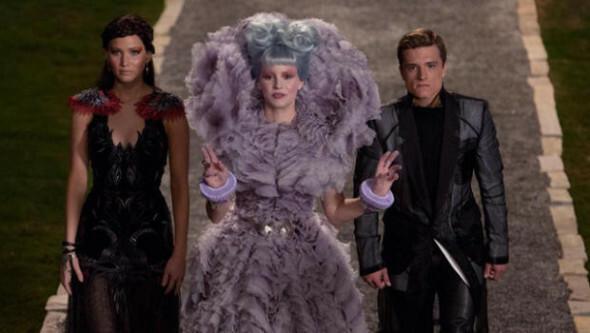 The story picks up with Katniss (Jennifer Lawrence) and Peeta (Josh Hutcherson) on their victory tour, accompanied by their ever-present handlers Haymitch (Woody Harrelson) and Effie (Elizabeth Banks). While the group is away, President Snow (Donald Sutherland) and new chief game maker Plutarch (these names!) Heavensbee (Phillip Seymour Hoffman) worry that Katniss has become a symbol of hope for the common people, a symbol which could spur another uprising. Planning to eliminating that threat, Snow declares the next Hunger Games will be played only by former victors, which means Katniss and Peeta will again be fighting for their lives. While this sounds like just another empty rehashing of a successful formula, Catching Fire‘s scriptwriters, following Collins’s lead, have more on their minds. Simon Beaufoy (Slumdog Millionaire/127 Hours) and Michael Arndt (Little Miss Sunshine/Toy Story 3), both Oscar winners, fill their script with the emotional heft needed to create a sequel which immediately creates potential for a truly memorable trilogy. We connect with the characters on a deeper level, the sociopolitical undertones carry greater nuance, and there are even some sly parallels offered between the superstar status of Katniss and the actress playing her. Speaking of Lawrence, well, if you’re sick of hearing she’s great, call a doctor. She grounds Katniss in vulnerability while never relinquishing the character’s heroic status. Perhaps more impressively, she sells the love triangle, making Katniss’s conflicted feelings for both Peeta and Gale (Liam Hemsworth) totally believable. And not a shirtless wolf-boy in sight..who knew it was possible? The strong supporting cast is peppered with new faces, such as Hoffman, Jeffrey Wright, and Jena Malone , who plays against her former child star type as the edgy Johanna. Keep an eye out for her elevator scene, one of the film’s lighter moments. It’s a scream. All the separate elements are wrapped in a nice holiday bow by director Francis Lawrence (no relation). He smoothly guides the film from spectacle to solitude and back again, providing some arresting visuals in the process (see the IMAX version if you can). Despite director Lawrence’s heretofore lackluster resume (Constantine/ Water for Elephants), the choice to keep him at the helm for the Mockingjay finale (to be split into two films) now seems totally justified. Okay, Catching Fire does stumble here and there. The scenes of Haymitch introducing Katniss and Peeta to their new opponents seems more fitting for an American Gladiators reunion and…well, that’s about it. Fans of the book should expect a fantastic realization of the world they imagined, while those who haven’t read the novels (like myself) get to fully enjoy the delicious twist at film’s end, one that may invoke memories of a certain empire striking back. Either way, The Hunger Games: Catching Fire is rousing, epic entertainment.